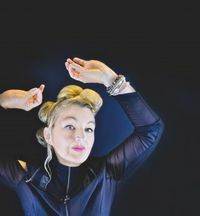 Iconic and enigmatic, Jane Siberry is one of the world’s most unique and gifted singer-songwriters. Blessed with a sincere integrity and emotional depth, her work has spanned three decades, with the release of 14 studio albums and performances on concert stages around the world. Her 1985 album “The Speckless Sky” was a huge critical and commercial success and the follow up albums “The Walking” “Bound By Beauty,” “When I Was A Boy,” and her signature song “Calling All Angels” cemented her status as one of the world’s foremost performance artists.